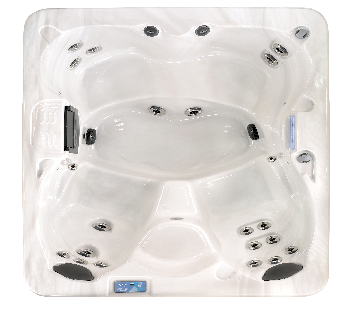 The Image is a superb quality, great value for money 4 seater hot tub. Ideal for couples or families with young children, the Image has a 2 by 2 layout – the two deep reclining seats allow you to stretch out and enjoy a well earned customisable massage, and the bench seat opposite is slightly shallower which is perfect for the smaller ones. In terms of size the Image hot tub is nice and compact, so if you’re tight for space or would just prefer a smaller hot tub this is a great solution. Visit our hot tub showroom in Kent to try the layout for yourself.